"It's not about us. The dilemma is our children." 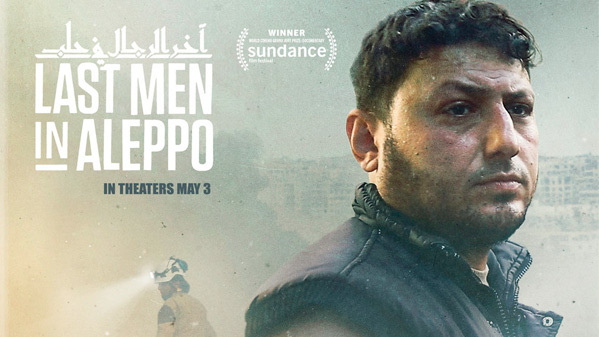 Grasshopper Films has unveiled an official trailer for the acclaimed, award-winning documentary Last Men in Aleppo, taking us deep inside the war in Syria. The film profiles and follows three different founding members of the humanitarian group known as "The White Helmets" (official website), who have stayed behind in Aleppo while the city is still under siege in an effort to save lives. This trailer cuts right down to it, and is a heartrending, harrowing look at how bad the war in Syria has become, and what it's doing to that country. I missed this at Sundance, where it won the World Cinema Grand Jury Prize, but I'm planning to catch it as soon as it's released. This should be on your radar. After five years of war in Syria, Aleppo's remaining residents prepare themselves for a siege. Khalid, Subhi and Mahmoud, founding members of the group known as "The White Helmets", have remained in the city to help their fellow citizens-and experience daily life, death, struggle and triumph in a city under fire. Last Men in Aleppo is directed by filmmaker Firas Fayyad (@firasfayy), edited by Steen Johannessen (a long-time veteran film editor). This first premiered at the Sundance Film Festival earlier this year, where it won the World Cinema Grand Jury Prize for Documentary. Grasshopper Films will be releasing Fayyad & Johannessen's Last Men in Aleppo in select theaters starting on May 3rd coming up soon. Worth a watch.